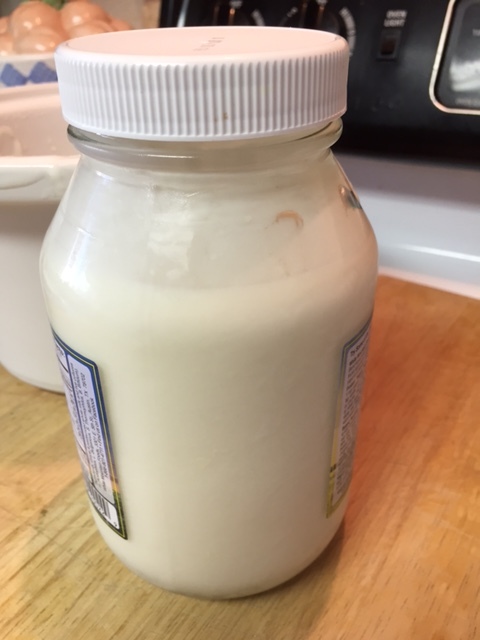 To make homemade yogurt all you need is a half gallon of whole fat pastured fed milk and about a half cup of organic yogurt or a yogurt starter. We used the latter. If you do decide to use yogurt as your starter, avoid any flavorings and stick to plain, unflavored yogurts. We are so amazed that we could do this. Why you may ask? Because we did not make it with a yogurt maker incubator. It was made with a crock-pot and the oven. Here is how it is done. 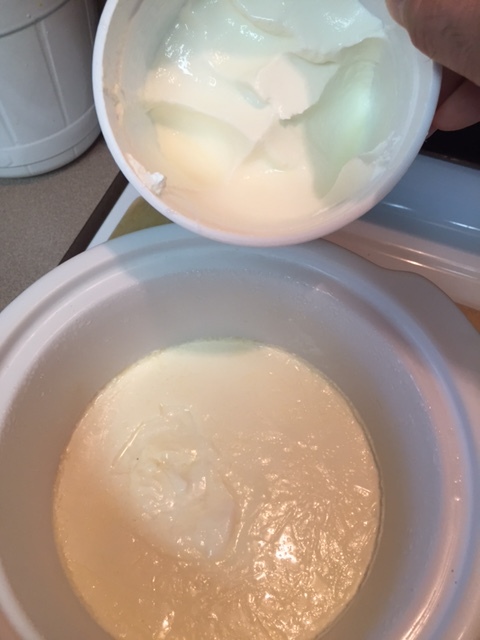 Using a crock-pot able to hold 4 cups of milk (1/2 gallon) pour milk into the ceramic bowel and place crock on low for 2 to 3 1/2 hours or until the milk reaches 180 degrees. Our crock-pot warmed the milk to 180 in about an hour and forty minutes. According to the National Center for Home Food Preservation, this heating step is necessary to change the protein structure in the milk so it sets as a solid instead of separating. Next, remove one cup of the warm milk, and incorporate the yogurt starter into the milk then add it back into the crock-pot and mix in well. Heat the oven to about 200 degrees for about 5 to 10 minutes and turn the oven off. Remove the ceramic pot insert from the crock-pot heating element and with the lid on wrap the pot in a large towel. Place a cookie sheet on the center rack of the oven, and put the towel wrapped pot onto the cookie sheet. Close the oven door and turn inside oven light on (if your stove is electric – if gas, it is not necessary) and let the milk and starter incubate for up to 12 hours. The towel will help hold the heat in, and turning on the incandescent light bulb will help maintain warmth in the oven. If your oven is gas, the small flame that is always lit will help maintain heat. To stop the process or the fermentation of the milk, remove the pot and unwrap it, putting the pot into the refrigerator for up to six hours and then transfer to a clean sterile jar. The yogurt has a thin consistency like Yoplait or Dannon yogurt. 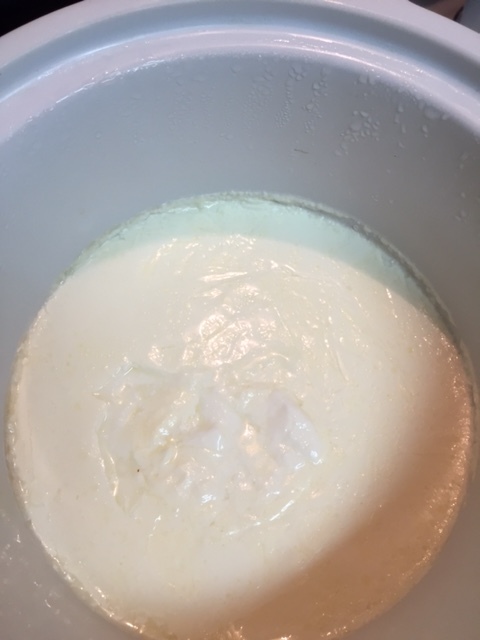 But to get a thicker yogurt like Greek yogurt or possibly Bulgarian style yogurt, you need to put the yogurt into a clean cheesecloth and let the whey drip off. In the dairy farm community, some farmers take the whey, which is mostly water with some lactose or milk sugars, protein, and yogurt cultures, and mixes it up with the cows’ feed. Some dairy farms are now adding the whey to their anaerobic digesters, which is a septic tank for cow poo. By adding the whey to the manure and letting it brew to the point of releasing a stinky gas that is then converted into electricity. One upstate New York farmer’s digester produces enough electricity to run the farm and sell some back to the grid (Consumerist). The whey from strained yogurt and even cottage cheese is an acid whey, also referred to as sour whey, and there is the sweet whey from cheese making. They two types of whey are used for many things, with two just mentioned. Link here to a recipe using whey to make Lacto-fermented Applesauce. 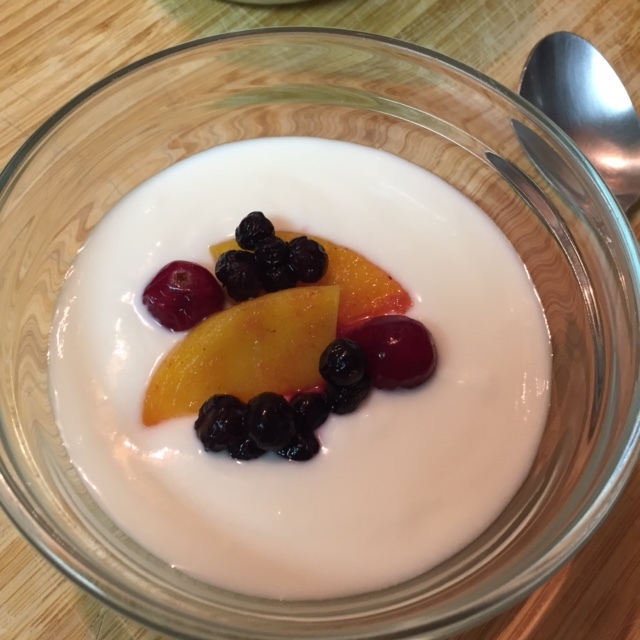 Enjoy your homemade probiotic or cultured yogurt with fresh or frozen fruit. We tried a little real maple syrup, and oh boy what a treat. My Favorite Snack: Yogurt with Viki’s Granola! This entry was posted in Cultured Foods and tagged acid whey, Angel, Apple Inc., Black Rock Desert, crock-pot, cultured foods, Ebay, fermented foods, homemade yogurt, Incandescent light bulb, LED lamp, LIFX, Light, Light fixture, Light-emitting diode, sweet whey, yogurt starter. Bookmark the permalink. 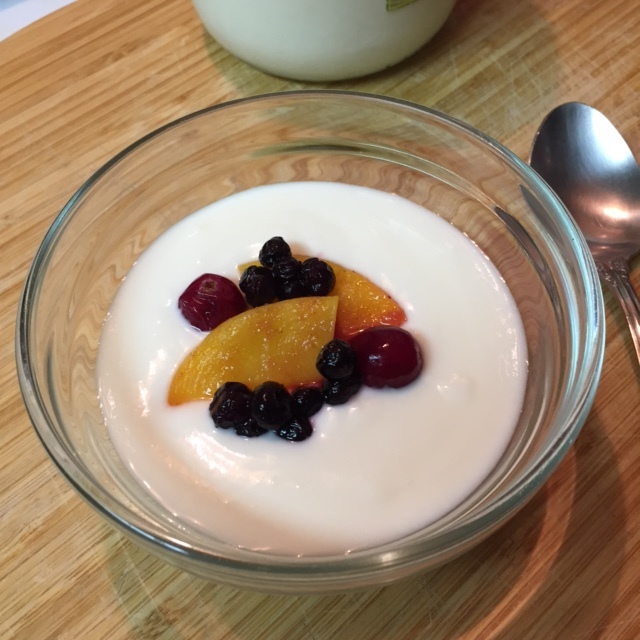 Homemade yogurt must taste fantastic. It really does Jovina. First time I have done this. I was surprised I was successful using a crock and oven. Next time I will drain the whey off for a thicker yogurt. I just add about 1/2 teaspoon of real maple syrup and it taste so good. Going to try and ferment vegetables next. I have done kefir and have tried to make kombucha but that failed.